Expect to Blossom. Prepare to Bloom. How to make the most of your time in Vermont. We want to give you the tools and support – and space – you need to really make the most of your time at college. In addition to our stunningly beautiful landscape, we will also nourish you with homegrown food and ample opportunities to explore and care for your body, mind and spirit. Let’s start with The Sterling Kitchen! Our kitchen and campus food system has been ranked #1 in the nation for 2 years running by the Real Food Challenge. This is no small feat and you will love the food you eat here and the atmosphere in which you eat it. Dunbar Hall is where students, staff, faculty and extended family and neighbors come to eat together. There is a snack table that is always populated with some fruit and fresh baked bread as well as an incredible selection of tea and coffee that’s always hot! It’s also not uncommon for students to do a “Student Takeover” of the kitchen and whip up something special for everybody once a month or so. Though you won’t find any vending machines or sweets abounding, the food here will ensure that you are fueled to excel in your academics, your work and your adventures. Want to see what’s cooking? Follow @TheSterlingKitchen on Instagram! If a doctor’s examination is required, the Wellness Center staff will assist with appointments and transportation. Excellent facilities are available in Hardwick, 10 miles from campus, and at Copley Hospital in Morrisville, 20 miles away. At Sterling College, athletics are about connecting students with the world–as an individual, a team, and as part of a supportive community. You can learn more about our Coaches, Teams and events by visiting our Athletics Page. 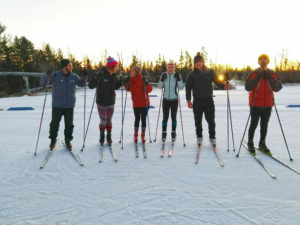 The Craftsbury Outdoor Center is just a hop, skip or ski down the road and is an incredible resource for all Sterling students whether you want to participate on an athletics team or not. Learn more about the COC, check out the perks you’ll receive as a Sterling student and view their calendar of events. Interested in being on a team? Interested in participating in a sport that isn’t currently happening here? Pavel Cenkl, Director of Athletics, wants to know! Contact him! Craftsbury Common is located in Vermont’s Northeast Kingdom which is a stunningly beautiful rural place. We have all the fresh dairy, meat, and vegetables we can eat. We have wonderful people, music, libraries and culture to enjoy – not to mention epic recreational activities – but there are some things we don’t have in our immediate vicinity. Do not fret! Everything you need can be obtained in a hop, skip or a jump. Vermont is a pretty special place and if you haven’t been here before, you’re about to find out why. A dynamic combination of old fashioned values and progressive thinking results in down-to-earth people who are working hard and making the world a better place. Opportunities for outdoor adventure in Vermont are boundless! Skiing, hiking, paddling, biking, climbing, camping and more can be found in every nook and cranny of the state. Here are a few more reasons to be thrilled that you’re on your way into the Green Mountains! Sterling College is located in a part of Vermont known as the Northeast Kingdom. The Kingdom is the most rugged, rural, and beautiful part of the Green Mountain State. We can’t wait to welcome you here! There’s quite a lot that we left off this list so, if you don’t see what you’re looking for, just ask! Enrollment is confirmed, forms are submitted, questions are answered, bags are packed and you know how to find us! Still have some questions?